How to Care for Your Pet After You’re Gone. Terminally ill man’s dying wish is to find a home for his beloved dog. 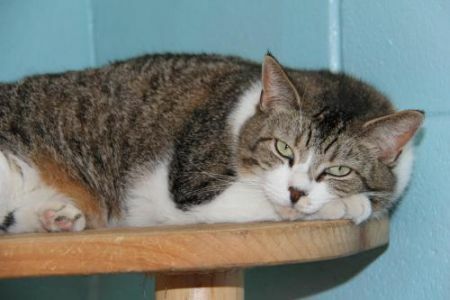 Beast, waiting for a loving responsible home at Associated Humane Societies in Forked River, NJ. While these stories are gut-wrenching, the truth is these pets are somewhat lucky. They have parents who realized they would need new loving homes before it was too late. Too often pets are left without a home because their parents passed without warning and had not considered what would happen to their pet in such a case. We hear all the time from people around us about the horror of living with the death of a pet. Unfortunately the thousands of pets who have to live on in shelters without their parents don’t have the voice to tell us their story of heartbreak. Dying is a hard thing to think about, but most people force themselves to face it long enough to consider the effect on human family members and try to prepare for the worst. It’s time to do the same for your fur-kid. I didn’t enjoy researching my cats’ options for a possible life after me, but I do feel good knowing that they’ll have the best life possible. Unlike you, the courts consider your pets to be personal property rather than family members. Even so, there are a few ways you can take care of your pet after you pass. The simplest way is to add them to your will. Like all of your other ‘assets,’ they can be left upon your death to a friend or family member. You can provide for a specific amount of money to take care of your pet and provide specific instructions to the caretaker. If the caretaker does not provide the appropriate care, then they are not entitled to the money. Remember though, as it is a clause in your will, it will not take effect until your will kicks in, and probate and the distribution of your assets can take months. Therefore, in an emergency situation, it would not provide for the care of your pet until all those things are finalized. So, be sure someone close to you can and will care for your pet in the interim. As another option, some states allow Pet Trusts (Michigan State University’s Animal Legal and Historical center has a listing of such states here), that allow you to create a highly specific and legally-sanctioned arrangement that provides for the ongoing care of your pets. While you can assemble wills and trusts on your own, there are lawyers, services and even websites that can help you. It’s generally best to check with a lawyer to ensure your requests are legal and will be upheld even in light of a possible legal challenge in the future. What if you don’t have someone who can care for your pet when you’re gone? You can make arrangements with an adoption organization to care for your pet, with their food, medical care, etc. paid for by your trust or bequest, until they can find a new home for your pet. You can use the Petfinder Animal Shelter search to find an organization to work with. If you don’t have someone to care for your pet and you decide your pet should not be adopted out for some reason, there is one more option. There are organizations that offer a permanent home at a sanctuary where your pet can live out the rest of his or her life. Again this arrangement is made in advance and is paid for by your trust or bequest. I have visited one of these sanctuaries in my state, Safe Haven at Associated Humane Societies in Forked River, NJ. While I concentrated on their Kitty City, which is a great place with all the amenities of home and then some, as a possible home for my cats, their Animal Haven Farm is an amazing place as well. You can search the web for similar sanctuaries and havens in your area. Most importantly, be sure to explore your options and make your wishes clear to your loved ones. Disclaimer: The views and opinions expressed in this article are those of the author and do not necessarily reflect the official opinion or position of Discovery Communications, LLC or Petfinder or any affiliated entity. This post does not constitute professional legal advice and all readers are encouraged to consult with their own lawyers to ensure compliance with all appropriate local and federal laws.